More than 29 million adults in the U.S. — about 9 percent of the population — currently have diabetes, according to the Centers for Disease Control and Prevention. The obesity rate has more than doubled since 1980 and now hovers between 31 percent and 35 percent. About a half-million Americans die of heart disease every year, accounting for one in every four deaths. You see Minnesota’s Schwan Food Co., is the country’s largest supplier of school lunch pizzas. I am not debating the claim that tomato sauce will provide nutrients of approximately three tomatoes. What I have an issue with is the “extra” ingredients that are added. This is an economic pushing for an industry that was designed by our government as a weapon and as a way to make profits and to do that they need customers. We are the customers and they also have taken over the FDA (The U.S. Food and Drug Administration). Our taste buds have been hijacked by fake foods. Part of the answer lies in the economics of the food industry: the profit margins and scale of money from processed food companies offer where the growers of healthy foods can’t match. In 2015, according to the Center for Responsive Politics, processed food manufacturers spent $32 million on lobbying while the fruit and vegetable industry spent a mere $3.7 million. Follow the money. Kellogg’s has a $26 billion market capitalization because it does not just make cereal. It also owns Pringles and manufactures a variety of processed foods from Eggo Waffles to Famous Amos chocolate chip cookies. The entire processed foods industry is similarly consolidated. If you follow your favorite snack up the food chain, you’ll usually find that it is owned by a multinational company. PepsiCo owns Funyuns, Rold Gold pretzels, and Sun Chips. Ritz crackers, Oreos, and Wheat Thins sell under the Nabisco label, which is owned by Mondelēz International. So whenever a federal agency supports healthy foods, it picks a fight with a collection of the world’s largest companies. It’s a very simple logic: Supply and demand. If you have a demand for something, someone is going to supply you with it. The USDA released their first set of nutrition guidelines in 1894. 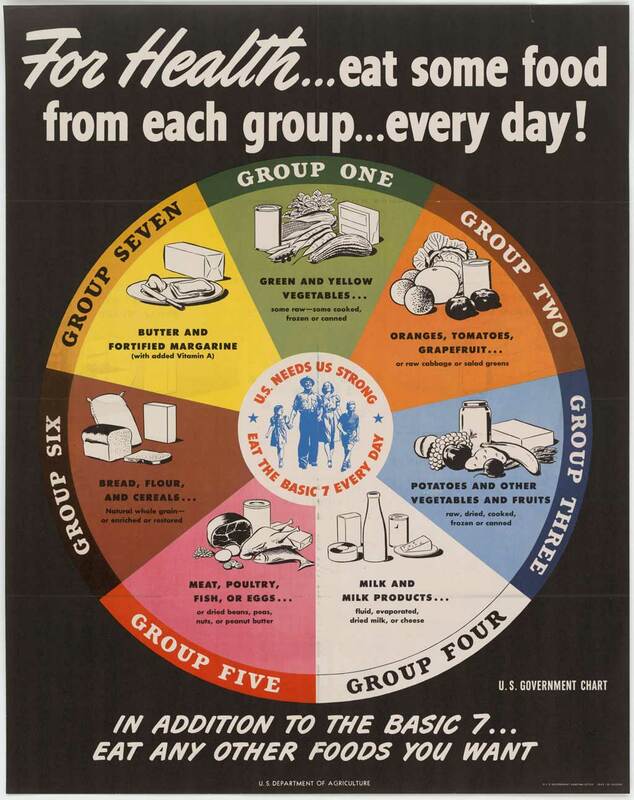 A 2nd revision came out in 1943 which the USDA gave us the BASIC 7. 1. Vegetables and Fruits – This makes no sense. Fruits and vegetables do not fit the same dietary role. 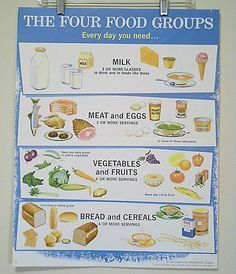 No mention of fats and we know that they are critical to body growth and function then there is #4 which is pretty much anything made from grains. 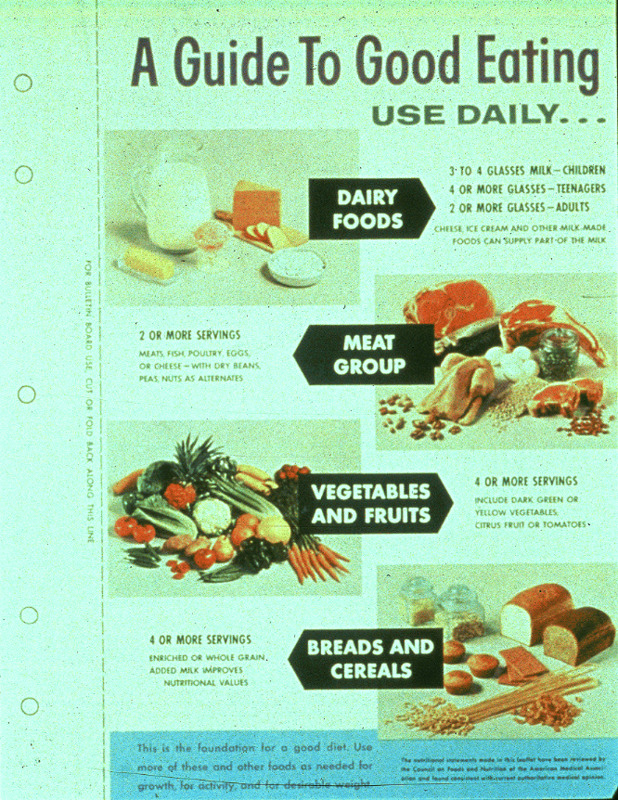 In 1961, another food guide line was issued after the scare of President Eisenhower had a heart attack. No one knew why, what , when or how heart disease occurs. Ancel Keys an American physiologist from the University of Minnesota, who studied the influence of diet on health. In particular, he hypothesized was that dietary saturated fat caused cardiovascular heart disease and should be avoided. He stated that saturated fats and cholesterol caused heart disease. Billions of dollars were spent to prove his hypothesis to be correct. He did a case study in seven different countries that he obviously cherry picked which ones to study. You see he started out with 22 countries and just tossed out the ones that didn’t fit his hypothesis. After Keys deleted the countries who didn’t fit his hypothesis , this only left him with only Japan, Italy, Great Britain, Australia, Canada and the US. In 1992, the USDA came out with a new Food Pyramid. Unlike the others this one states how healthy diet is breads, cereals, and other products made from grains. The government’s “food pyramid” resulted in a dramatic rise in obesity , diabetes, cancer, and heart disease among other health issues. Yet again, it has been revised! This time they are suggesting cutting down on grains and increasing the amount of veggies recommended but what they fail to mention is to eat ORGANIC! Although you may eat more veggies which is always a great choice for your health , it’s very vital to understand that many vegetables contain high levels of pesticides. A new analysis by the USDA actually revealed at least 34 unapproved pesticides on cilantro samples. 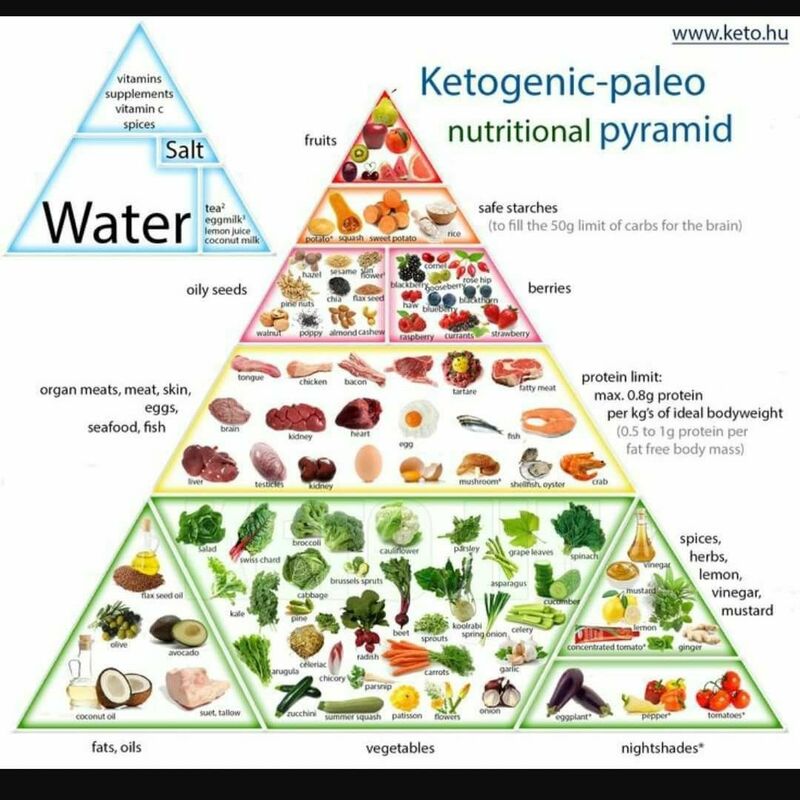 Now , with all this being said we can certainly begin to understand America’s food industry and its lobbying process and we can begin to understand a certain mystery behind the food pyramid: why it was created and still promotes a diet although it certainly doesn’t benefit the American people. Our Food Pyramid is Corrupt Foundation that can be bought. There is so much more at stake here like wealth, power and social status. Looking at the bigger picture. Follow the money. It’s a revolving door. This is bigger than any of us can imagine. It’s more than just being lied to about the food pyramid. This revolving door certainly enables certain private vested interests to have a strong influence, way beyond that of us ordinary citizens, on how the government works, and that the country is still increasingly being run by a cozy group of insiders with ties to both government and industry. Most people keep a blind eye to it and actually its safer to not fight this fight or suggest anything alone these lines if you want to stay alive. This has been termed crony capitalism. People have been killed for lesser whistle blower statements. Audrey Childers is a 10x published author, blogger, freelance journalist and an entrepreneur with over a decade of experience in research and editorial writing. She is also the creator and founder of the website the hypothyroidismchick.com. Where you can find great tips on everyday living with hypothyroidism. She enjoys raising her children and being a voice for optimal human health and wellness. She is the published author of : A survivors cookbook guide to kicking hypothyroidism booty, Reset your Thyroid, The Ultimate guide to healing hypothyroidism and A survivors cookbook guide to kicking hypothyroidism booty: the slow cooker way. You can find all these books on Amazon. This blog may be re-posted freely with proper attribution, author bio, and this copyright statement. This entry was posted in Uncategorized and tagged #corruptcongress, #corruptfda, #corruptfoodpyramid, #corruptusda, #liecongress on April 21, 2018 by thehypothyroidismchick.